This entry was posted in Racing on May 31, 2016 by Steve Tilford. It seems like The Growler was a long time ago, even though it was just Sunday. I have to say, honestly, I’d never heard of the race before. 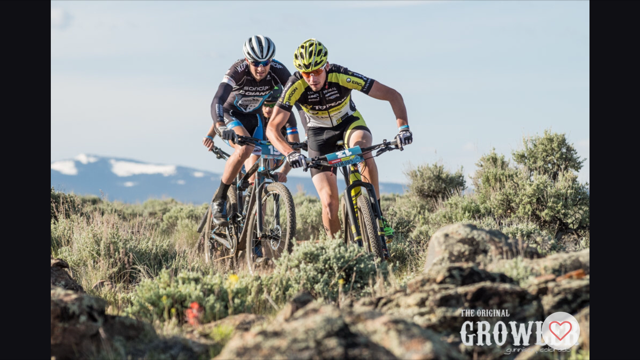 I have been pretty removed from MTB racing on all levels, even though I did win Lutzsen 100 last year, rode Leadville, plus Chequamegon and Berryman. The scene is so disjointed now that unless you are living the life, it is difficult to know exactly what is happening on a National level. The Growler is two loops of approximately 32 miles. The two loops are a little different, but the terrain is the same. 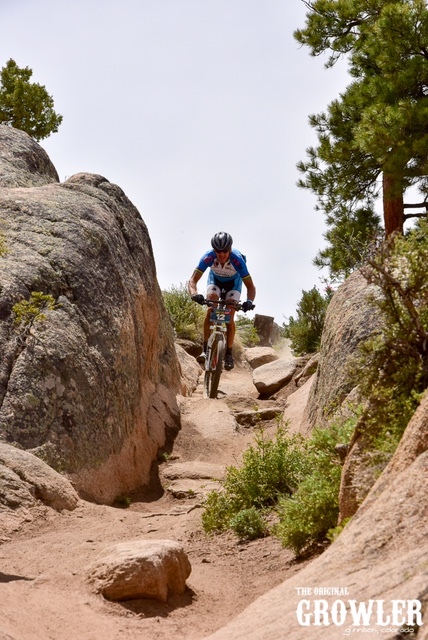 You ride up to a plateau and then ride undulating singletrack forever. 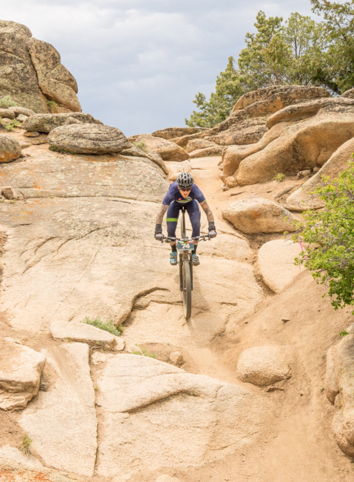 Mainly you are riding smooth singletrack through sagebrush, but every so often, like every mile or two the trail heads to a rock outcropping and it is pretty technical. Not technical like Lake Wilson, large granite boulders with multiple lines to choose from. Not knowing the correct lines is a big disadvantage. But, for me, it didn’t really matter. The race starts up a 5 minute, steep climb after a neutral 4 mile roll out on pavement. No one was really charging early because the climb loomed ahead. This is where the race was over for me. I was hoping that I was going to be like last year and be okay at altitude. I did alright in Winterpark and the GoPro games in Vail without being here. That wasn’t the case on Saturday. As I predicted, I crawled up the climb. VIncent passed me about half way up and distanced himself from me. As did nearly everyone else. I was bad. The problem was that after another mile or so, we turned into a very long singletrack area. And a few guys ahead of me were pretty lousy at riding singletrack. The front group of guys, like the first 1/3 of the field, disappeared into the distance. So, I decided I was just going to enjoy. I did a pretty good job of this. The open singletrack flowed wonderfully. It was a blast getting back the skills needed to go fast. The technical rock sections were a challenge in the masses. Lots of walking, where it should have been riding. Somewhere about half way through the first lap, I was walking in line, up a narrow rocky section. A guy tried to ride a high line by us and screwed up above me. 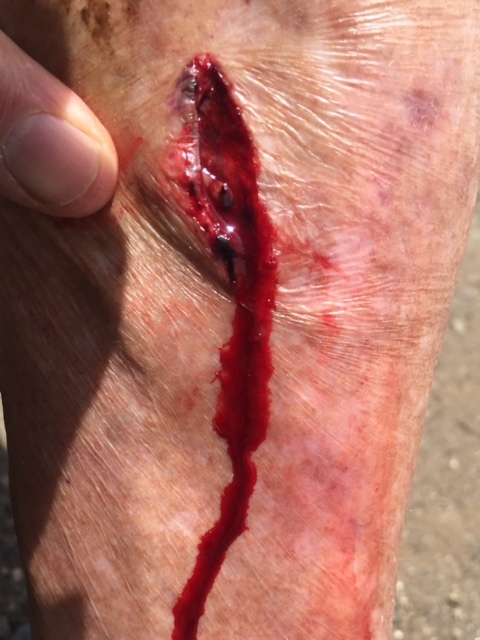 He fell over into my bike, which jammed my pedal into my left shin. I looked down a blood was streaming down into my sock. I hate those shinbone hits. They hurt like crazy and knot up. I got on my bike a little bit later and my leg was still hurtin’. Pretty soon I shook it off, but it took a while. Just a while later, I thought I spotted Vincent up ahead. He was way far away. It took me a while, but it was Vincent. I couldn’t believe that he could be blown at only 2 hours in. I caught up with him and it turned out his fork on his new Scalpel was blown and was locked down. So his front end of his bike is 4 inches low, with no shock. That would have been nearly impossible to negotiate. It turned out to be. Here’s how bad I was. Kalan Beisel, who beat me last weekend by around 2 minutes in Lake Wilson in 2 :15, was 9 minutes ahead after 1:20. At 2:30 he was 15 minutes ahead. By the end I was nearly 40 minutes back. Kalan finished 2nd again, less than a minute out of winning. The next lap was hard. I would have been happy stopping at one lap. It was already over 2:30 hours and I was pretty worked. My lower back and back of my arms were sore. But, it was another lap. At the top of the start climb, Vincent was standing at the top with a bottle. He’d stopped to try to pump up his shock, with no luck, so he took a shortcut to feed me. The lap was super fun. I never got any worse and as the mile ticked off, actually felt a little better. There was really no one to catch. I passed a couple guys in the first half of the lap and then there was no one. I thought I was riding the technical section better, I was, but towards the end, I started screwing up. I think it was because I was tired. I stopped at a couple feed stations and refilled my water bottle. I never do that, but didn’t really have any reason not to. So, that was it. I finished 16th place. I’m not sure how many people started. 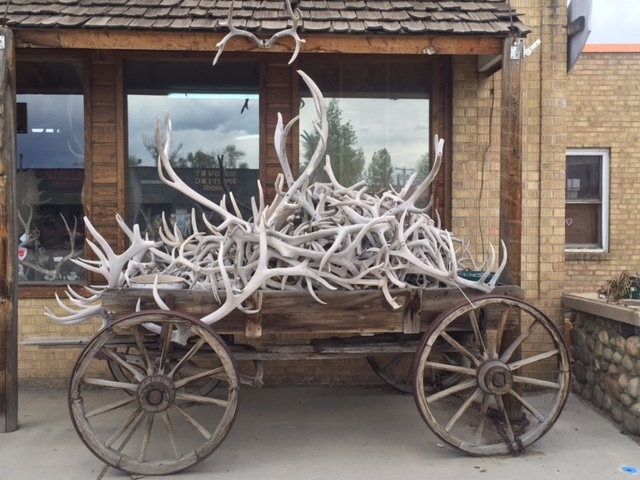 There is a 350 riders limit each day, Saturday and Sunday. On Saturday, it is only one lap. Then on Sunday, it is the Full Growler, which is two laps, and then the overflow from the 1/2 Growler. 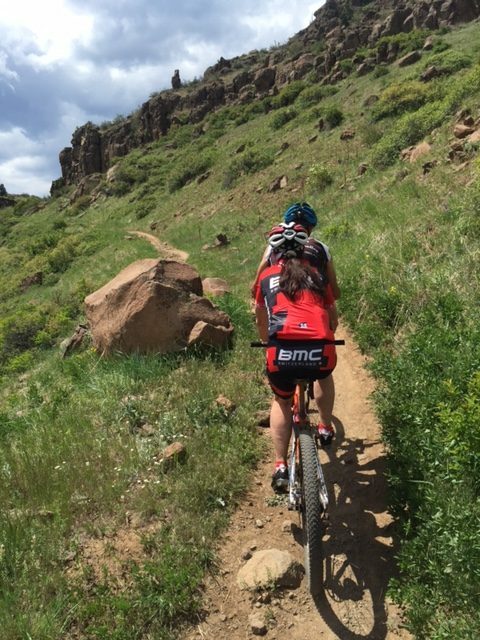 The trail system around Gunnison is super. Super maintained and extensive. It is a MTB destination for sure. The race finishes out of town and then you just ride back to the start/expo area on your own. It looked like it was going to start raining, so I figured I should ride back quick. But, VIncent had driven the van over and I went over and wiped off. I then realized that my shin scrape was a deep gouge. Like stitchable. So, VIncent drove to Walgreens and got some stuff to wash it out and I rode back. The expo was small, but super fun. Free beer to the finishers. They actually hand you a $10 bill to go and buy food from the vendors there. They had super burritos, and lot of other great choices. I was planning on staying for the awards ceremony, but Trudi and just flown in from Winston-Salem and I was thinking I should address the cut. So we started driving. The drive back was good. A little hail and sleet, then just scenic Colorado. The drive from Gunnison back to Denver goes through a bunch of Colorado that a lot of people don’t see that much. No destinations there, but small towns that face harsh conditions in the winter. I like it. Brian and Michelle Jensen were at Vincent’s too, along with Trudi. They are shopping for a house to buy. Brian is starting a new job on Monday, after the Dirty Kanza next week. They are a little stressed by the prices, which I understand. We went out and rode North Table Mesa yesterday. First Vincent and Trudi rode on a tandem, then we all went out and rode our own bikes. Brian, Vincent and I rode a little further and faster. I ended up with over 3 hours again. Not exactly rest. We are heading back to Kansas today. Trudi has to fly to Belgium tomorrow from Kansas City. Then get in a car and drive from Belgium to Southern France. Man, her schedule is crazy this year. These guys were ripping it up at the front. Bryon Dillon, Ergon in front, won, just ahead of Kalan Beisel. Kalan’s wife, Amy, won the woment’s race, just a few minutes behind me. There were tons of places like this. And narrow sections you had to snake through. 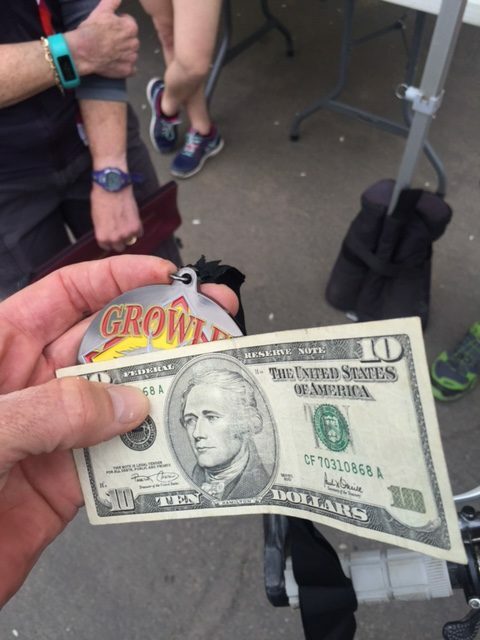 NO one has ever given me lunch money after finishing a race. My chainstay at the finish. I had most this stuff with me. I hadn’t done this in a long time. Actually, since I use to race MTB full time. Outside magazine did an article about me stitching myself up once. It isn’t that hard. Tying the knots is the hardest part. Trudi and Vincent on the tandem. 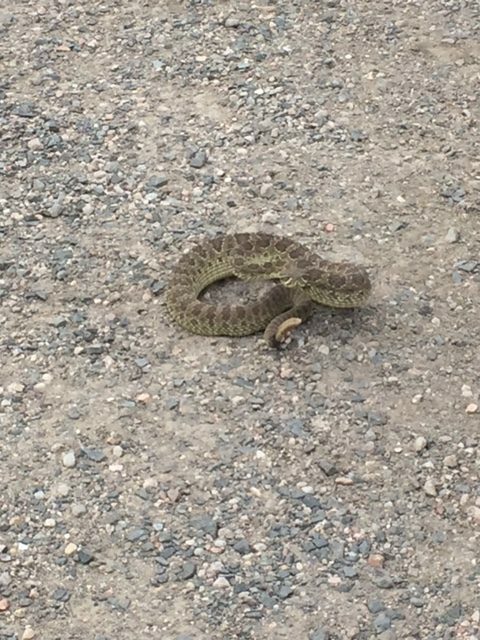 We ran into this guy riding yesterday on North Table Mesa. Just part of the legend . . .
I’ve read it all now…. And I thought I had a pretty good first aid/emergency kit. 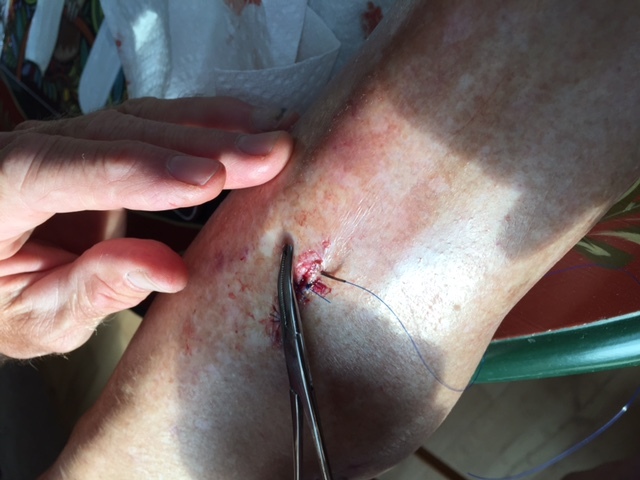 Can’t believe you stitched your own leg, that’s like Rambo in First Blood stitching himself up. Except Rambo did it without anesthetic. 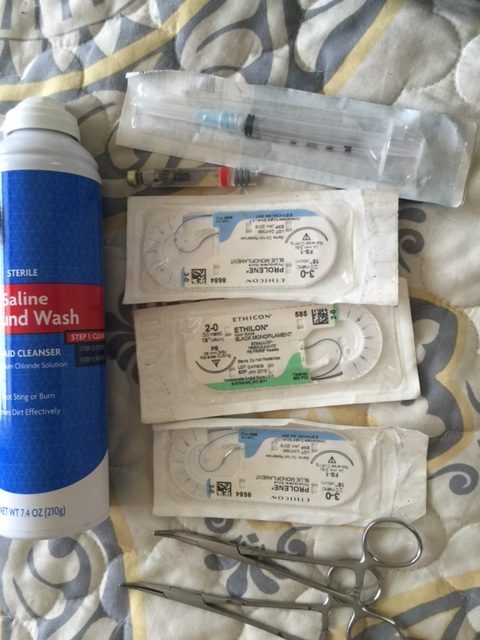 Thought I saw a needle there in your kit, was that anesthetic? Giving myself the shot to numb the area for stitching would probably make me pass out. Gnarly! Ever since I found out it was Kalen in the Tom Danielson photo he has become my new favourite cyclist. The issue Vincent had with the Lefty is a real issue. My scalpel has been in he shop twice with the same result since I got the bike back in October 2015. Warranty covers it, but time off the bike is a bummer. 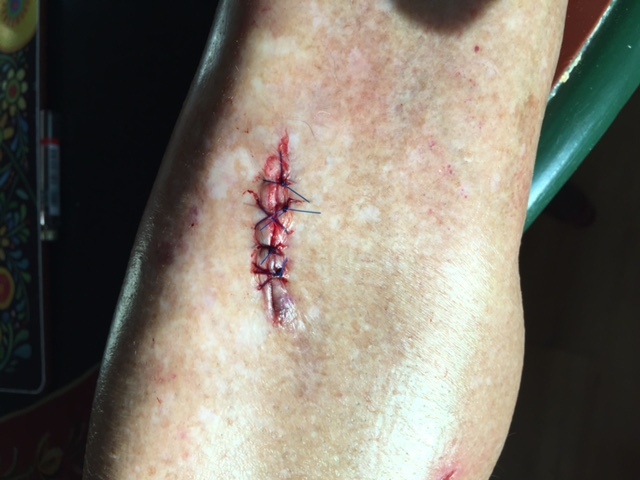 Stitching yourself takes a special kind of grit.. Tough Tilly. Those Lefty forks need to be left a historical footnote. They do NOT work. And Steve was written up in Outside mag long ago, Spec days, for stitching himself up. Or don’t any of you remember that? Jon, For that model of Fork Cannondale has a fix. Something to do with a new spring in the air valve. Have the new one installed and you will not have the problem again. I have the newer 2.0 fork (2017 Scalpel) , I guess the first batch that went out had grease in an area that was not supposed to have grease. 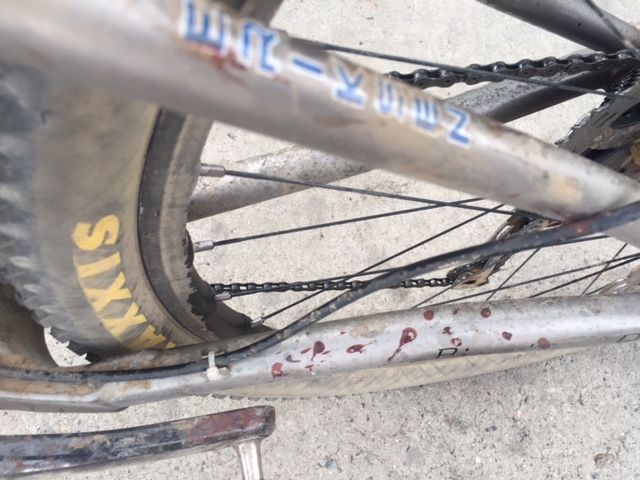 Racer discovers there are real risks in bike racing. Vincent, Your correct. I had it fixed once already back in November. The fork failed again last week, so back to the LBS it went. How was the pickle juice? I’ve seen him stitch himself before. No anesthetic, maybe he’s got some Lidocaine by now. I suppose he’s used to it. Not to mention, Lefty forks are REALLY ugly. I think the pickle juice works for me. I’ve used it twice when I felt like I “should” cramp and the cramps never occurred. So, so far, so good. He wasn’t the only one complaining about the master’s nat’s crashfest. In fact his write up was pretty restrained from others I read. Ok, that was a slice of awesome. Nice job coaching, Stacie. What about the It’s the Nerve stuff, now marketed as HotShot? How was your experience with that? Do you plan to use it again? Amy is Kalan’s sister. Fast family. I was thinking of Javier Bardem in “No Country for Old Men” when I saw Steve’s self surgery. Even if I had the talent, I couldn’t have been a pro racer any more than I could have been a boxer.